For your next executive meeting. Features a sleek zippered closure, smooth grain simulated leather, inside organizer, curved outside pocket and pen loop (pen not included). Get a promotional product that's "on the money" with the Wall Street padfolio! 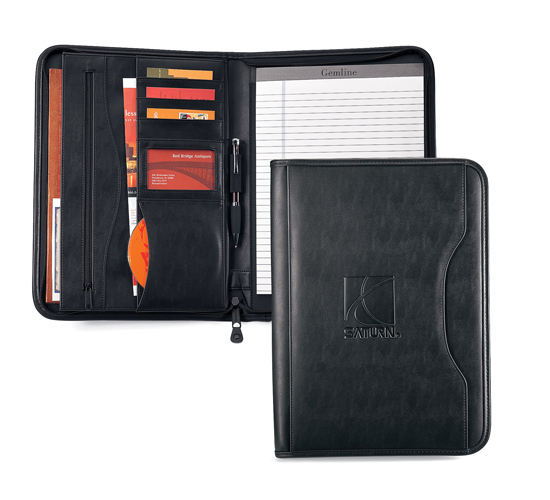 Made of smooth, simulated leather, this stylish padfolio features a zippered closure, inside organizer, pen loop, curved exterior pocket, slash pocket that fits most tablets and an 8 1/2" x 11" paper pad. This giveaway also accommodates an A4 paper pad and is perfect for any event. Have your logo debossed or silkscreened for brand recognition. Order yours today! Bulk / 37 lbs / 20 pcs. / 24 x 11 x 16box.